Expert Tips to Help You Get the Most for Your Treasures! This article is Copyright 2009 A&R Estate Buyers in Chicago. No part may be used without expressed written consent by copyright owners. As of this writing, the market price for an ounce of gold has been hovering near or above the $1000.00 mark for an unprecedented stretch of time. As a long time Gemologist, G.I.A. and Estate Buyer since 1981, I am excited about this fact, but I am simultaneously being flooded with calls and inquiries about this wondrous commodity called gold. “How about all those “Cash for Gold” ads? From 1833 to as recently as 1971, the average price of gold ranged from approximately $20.00 to $40.00 per troy ounce. Think about that for a moment. If you bought ten ounces of pure gold at, say $35.00 in 1971, your $350.00 investment would now be worth around $10,000.00! Please join me in having a good cry, because I too, didn’t have a clue back then! From 1972 through 1978 there was a growth period for gold, ranging from an average of $58.00 to $193.00, which was relatively significant proportionately. Then, in 1979, amidst a flurry of world activity (and some questionable market practices, which are not necessary to explain here), gold went through the roof! Remarkably, the highest price for an ounce of gold (at that time) hit approximately $850.00 in January of 1980. On a side note: Shortly after that milestone, I started working for a friend who was in the jewelry business. Selling and buying gold became all the rage, and I was hired to test and buy gold in a tiny shop on the north side. This wild ride on the gold market continued until sometime around mid-1981 when the price of gold went into a long “cooling” period. The price per ounce from 1981 to 2005 averaged between $460.00 and $278.00 and the world settled and adjusted to these new averages for this 14 year-long stretch. In mid-March 2008, gold went over $1000 per ounce for the first time in history, and has been hovering around or below that mark since. As of this writing (October 2009), this is the first stretch in history that gold has been able to sustain the $1000 level for at least four days in a row. Exciting times? Yes! But how does it affect us? Coming in part 2: Value factors for your gold: Weight, Purity, Resellability and Profit Margin. Previously we discussed the brief history of recent gold prices. Now we can look at some value factors. Okay, here is a shocker. 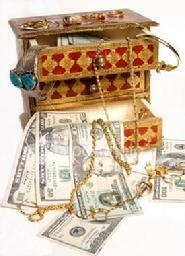 If you have an ounce of gold jewelry and gold is $1000.00 per ounce, you are not going to get $1000.00. Why you ask? Here are some common factors that will determine the value of your gold items. 1. THE WEIGHT of your item. Firstly, an ounce of precious metal is not the same as an ounce of flour, meat, liquid etc. In other words, your diet scale is no good because it measures in ounces Avoirdupois. Precious metals are measured in TROY ounces, which are heavier. So, if you sneak around and weigh your bracelet on a Whole Foods meat counter scale, and it says “one ounce,” it will be LESS than an ounce TROY. Weird? Yes. A troy ounce weighs around 1/10 of an ounce MORE! a. 10 karat gold is .417 pure. Most class rings and a lot of “discount Shopping Mall Jewelry” fall into this category. b. 14 karat gold is .585 pure. Most department store jewelry and the majority of U.S. and European jewelry fall into this category. Necklaces, Bracelets and Rings, etc. Think of it this way: you need to have 1.71 troy ounces of 14 karat gold to actually have one ounce of pure gold. (1.71 troy ounces of 14 karat X .585 purity = 1.00 troy ounce of pure gold. And even then, you won’t get paid the market price of an ounce of gold. More on this later. c. 18 karat gold is .750 pure. Finer U.S. and European jewelry. Tiffany, Cartier etc. If you’ve been shopping at those places, you probably don’t need to read this article! d. 20, 21 and 22 karat. India and Middle Eastern jewelry can range from .83 to .916 purity and is usually a bit orange colored, and quite heavy. e. 24 karat. Chinese handmade jewelry can often be .999 pure, and is distinctively soft and heavy with a strong orange overtone. If you have a troy ounce of this, will you get $1000 an ounce? No. Assuming that it is not collectible and the value is based on the gold price, you will get a bit less than the “spot price.” Read on as to why. f. Other karats can range from .333 or .375 from England or Ireland. g. Many world gold coins can range from .999 (Canadian Maple Leaf, Chinese Panda) to .900 (most U.S. gold coins). 3. THE TRUE RESELLABILITY of your item. Sad to say, but many of the items that are sold to gold dealers are recycled or scrap. Only uniquely resalable items will be bought at premium prices. Cartier, Tiffany and other important names will bring good premiums, but nice modern jewelry will often be disassembled and recycled. You will not get paid for any sentimental value. 4. THE BUYER’S PROFIT MARGIN. This is KEY. There is no regulation on this. This means that they can pay you whatever you will agree to. Use common sense. If you go somewhere where the overhead is high, that is: if the office is very ritzy, or they spend a jillion dollars on TV ads, then someone must pay for this. Who? You, the consumer. In the real world, every jewelry related business strives to make profits ranging from 5% on bullion transactions to 30%-40% or more on certain items. But be aware, many gold buyers encourage their employees to pay as little as possible, but as much as necessary to buy your gold items. The buyer must also recoup their refining costs, which can range from 2% to 10%, and of course, they must pay for their employees and overhead with the profits from your gold. This is why you won’t get the market or “spot” price for used gold. You can, however be smart enough to maximize how much you get paid. Coming in part 3: Tips for getting the most money for your gold. Okay, here are some tips. Go to an established business. Not one that has just sprouted up since the gold rush. If you go to one of those hotel buying events, please make sure that you know the address of the main office so you can find them in case you have a dispute or complaint. Do your research. Ask a few questions about what their profit margin is. Have them tell you how much your gold weighs and what carat it is. If they get insulted or clam up, go elsewhere. Get a couple of opinions. Avoid the hard-sell artists who pressure you to “sell today or the deal’s off.” Ask about their qualifications and experience. Realize that if you are holding the gold, you are the boss, not the buyer! Re-read the last sentence. If they sense that you have no idea about value, they will often pay you a very low rate. Again, don’t be afraid to get a second opinion. If they try to make you feel bad about this, a red flag should be going up in your head. The city is full of gold buyers, but make sure they are licensed to buy second hand items. The city of Chicago is very stringent about this and regular jewelry stores are not allowed to buy gold unless they carry a separate Second Hand license, which requires a fingerprint and background check. “What about Gold Parties? I keep getting invited to these.” I have recently been approached to produce some gold parties. For those of you that haven’t been to one, here is what happens. The host invites 10-15 friends over for a get-together. They are instructed to bring their old jewelry. There will be free booze and good times for all. In another room, you will be guided one-by-one to meet with the buyer, who will pay cash for your gold. Sounds like fun? Yes it is. And profitable too. For you? Maybe. But remember, the host is getting a nice percentage, usually between 10% and 15% of the total payout to all the guests. Very nice part time job because typically, thousands of dollars are paid out. The gold buyer tells the guests that the host’s percentage is coming out of his end. But I have to tell you, the buyer will make his profit regardless, so the host is probably getting the money that you would get if you went directly to a respected Estate Buyer. So if you had $1000.00 worth of gold, you are paying the host $100.00 or more for that cheap champagne and finger sandwich. Ouch. And oh, those free drinks make it so much fun that you might not want to bargain for a better price from the buyer. So here is my suggestion: do a little research first. Have your gold weighed and appraised so that you have a second opinion. Otherwise, you might be surprised how much those laughs and champagne have cost you. “So should I send my gold through the mail?” Well, here’s the thing. I am sure that there are reputable mail-order gold buyers out there. But I am equally as sure that there are some sharks swimming around out there also. If you are in a remote area or cannot travel outside the home, this might be the only choice for you, but if you are near a big city, I encourage you to do some research. Once again, I would do some comparative shopping first, and above all, have your gold tested first. The problem is that the mail order buyers won’t negotiate with you. They will simply send you a check in the mail for whatever they decide to pay. If you disagree with the price, you only have a limited time to contest the amount if you think it is unfair. In the meantime, they hold your gold for a certain amount of days. If you miss the deadline requirements, too bad. The legality of this practice had been questioned. There are stories circulating about people who found it difficult to argue over the phone or email and would eventually give up, settling for whatever amount was forced upon them. If you are able, why not get in your car and visit two places and find out in a matter of hours? Plus, you can watch the buyer test and sort your gold right in front of you. It’s fun and educational to have someone explain the process, so try and experience this if you can. Besides, if you are unable to travel, a good Estate Buyer should be able to travel to your home or bank and evaluate your items for purchase. In summary, this truly is the best time to sell gold in the history of man, but alas, with any positive boon, there are those that would take advantage of the neophytes. So be informed, get a couple of opinions, and have fun with the extra cash you can get from your old treasures!